Over the next few weeks, multiple Team of the Season squads will be released for FIFA 18's Ultimate Team - check in-game regularly for up-to-date information. Iconic players of the past like Diego Maradona, Pelé and Ronaldo Nazário join FIFA Ultimate Team™ bringing with them unique items that reflect how their style and attributes evolved during their illustrious careers. Uncover the defining career moments of sporting greats like Roberto Carlos and Michael Owen, told in their own words, as they look back at the milestones that shaped their careers in FUT Stories. Compete and earn rewards in the all-new single player Squad Battles. Take on other squads from the FUT community, earn rewards and move up the leader board. 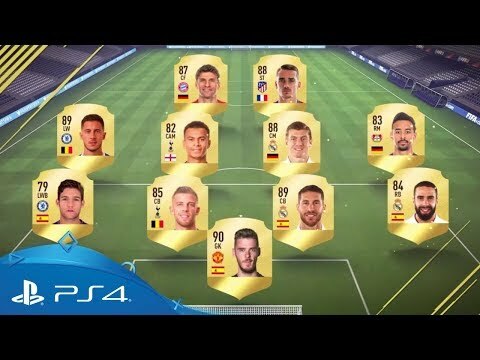 In Featured Squad Battle, you can challenge the squads of real-life football players, pro FIFA players and even celebrities. Keep FIFA Ultimate Team™ close at hand with the new Web App and also the Mobile Companion App. Trade and manage your squad while you’re away from your PS4.